For buyers of outsourced services, identifying exactly which qualities make the greatest contribution towards a positive relationship with an outsourcing partner is an ongoing and ever-changing process. Depending on which adjectives are discussed as a list of CRO/CMO attributes, the ones that rise to the top will vary. Priorities also fluctuate relative to the individual prioritizing the attributes and the type of business for which they work. Also, it seems that as soon as one prioritization of qualities is identified, new information or technologies become available and the precise mix of attributes changes. As soon as one prioritization of qualities is identified, new information or technologies become available and the precise mix of attributes changes. The fluid nature of the drug development industry – one that is constantly adapting to new health challenges, therapeutic technologies and regulatory legislature — is part of what makes it so difficult to define the priorities in partner attributes so the relationship functions like a strategic partnership to the benefit of both sponsor and CRO/CMO. The persistent state of flux reiterates the importance of keeping an open mind and learning from the experiences of one’s peers. That way, the pressure to find exactly the right business for an individual project diminishes and is replaced by confidence in finding a company with the right mix of attributes that will make for a successful strategic relationship. 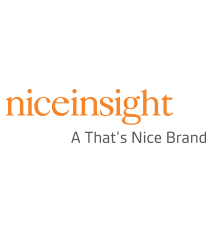 Recently, Nice Insight surveyed outsourcing buyers to ask them to separate the essential qualities of an outsourcing relationship from the non-essential, and then to rank their essentials into a hierarchy that reflects their importance. The respondent group comprised four different categories of buyers of outsourced services — Big Pharma and Big Biotech as well as Midsize Pharma and Midsize Biotech. We wanted to focus on established businesses with a history of outsourcing, rather than including emerging or virtual companies for this particular study. We anticipated there would be differences with respect to the “essentials” and how they are prioritized across the different buyer categories. Interestingly, Big Pharma and Big Biotech had more in common with respect to the way they prioritize outsourcing attributes than pharmaceutical companies or biotechnology companies of different sizes had with one another. For both Big Pharma and Big Biotech, “improved quality” and the “ability to use internal staff more efficiently” ranked third and fourth, following “reduced cost” and “operational expertise,” which held opposite first and second place ranking between these two groups. Big Pharma and Midsize pharma companies demonstrated differences in their ranking of essential qualities, especially with respect to use of internal staff. Midsize Pharma identified this as the number one priority when outsourcing, while Big Pharma ranked “ability to use internal staff more efficiently” fourth, after reduced cost, operational expertise and improved quality. The one area where Big and Midsize Pharma aligned was “access to ad hoc support,” which both sponsor groups ranked eighth, reiterating it is least important for a CMO or CRO partnering with Big or Midsize pharma companies. 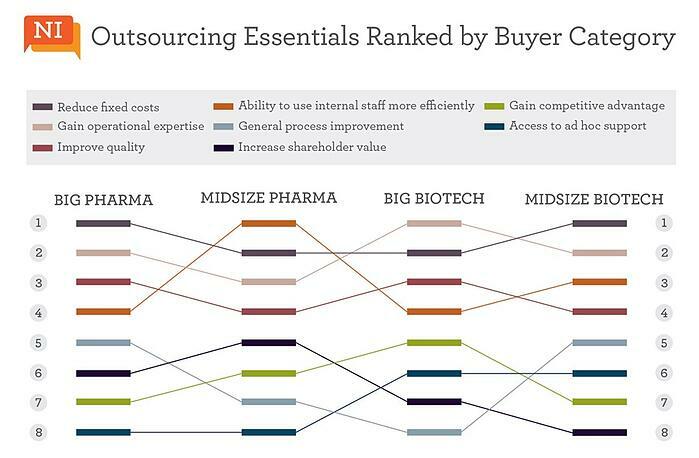 Unlike pharma companies, respondents from Big and Midsize Biotechnology businesses gave higher prioritization to gaining access to ad hoc support by engaging outsourcing partners. However, this was where the similarities among biotechnology companies ended. The greatest differences in ranking were with respect to how Big and Midsize Biotechs view “gaining a competitive advantage,” which was ranked fifth by Big Biotech and seventh by Midsize Biotech. Additionally, these buyers viewed “general process improvement” differently. This element ranked fifth among respondents from Midsize Biotechs and eighth — or the lowest priority — among Big Biotechs. Understanding how buyers prioritize their essentials in gauging contract service providers can offer advantages to peers in terms of decision making in outsourcing. It equally helps the service providers to position themselves more strategically. Among sponsors, knowledge sharing has enabled newcomers to learn from more established peers and adopt techniques that contributed to their success. Likewise, well-established companies with longstanding practices can potentially catapult their business to a new level of success by learning from the perspective of newer businesses in the industry.